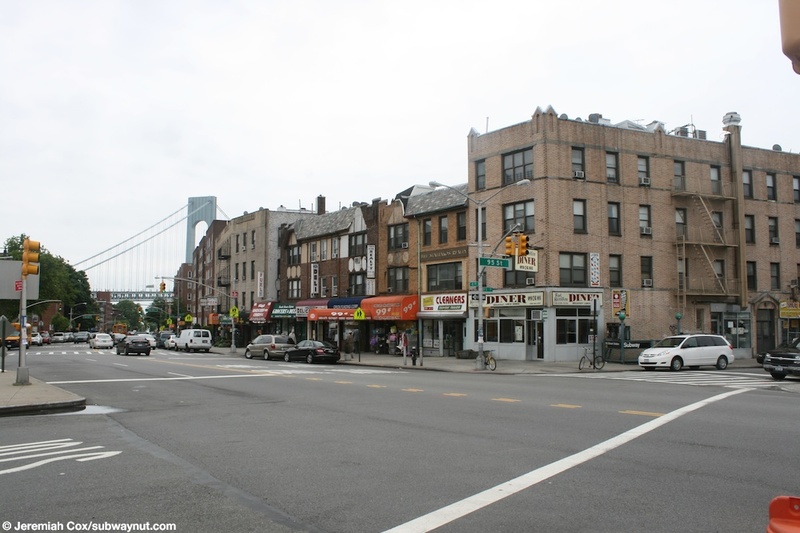 Bay Ridge-95 Street is the southern terminus of the R train and 4th Avenue Subway. The Verrizano-Narrows Bridge towers off in the distance from the subway station. The station has the standard two tracks with a single island platform layout. 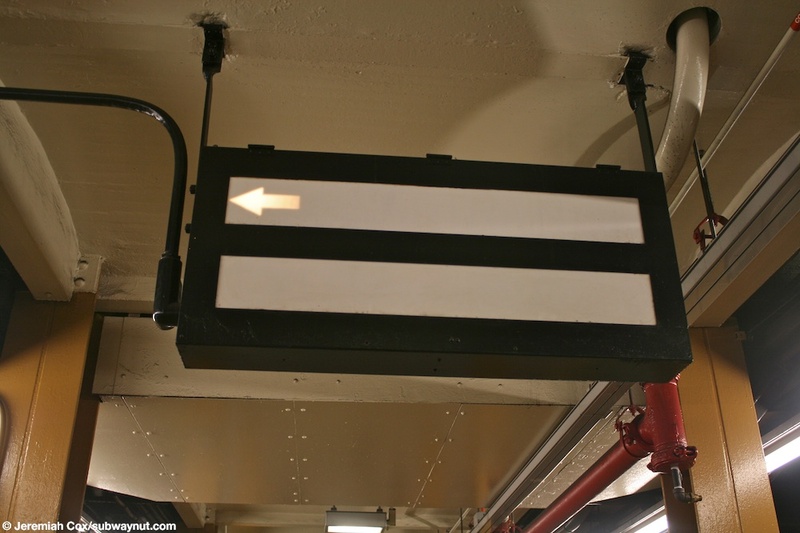 The next train to leave signs is simply an arrow that lights up on an old-fashioned looking sign that doesn't actually say what it's indicated. 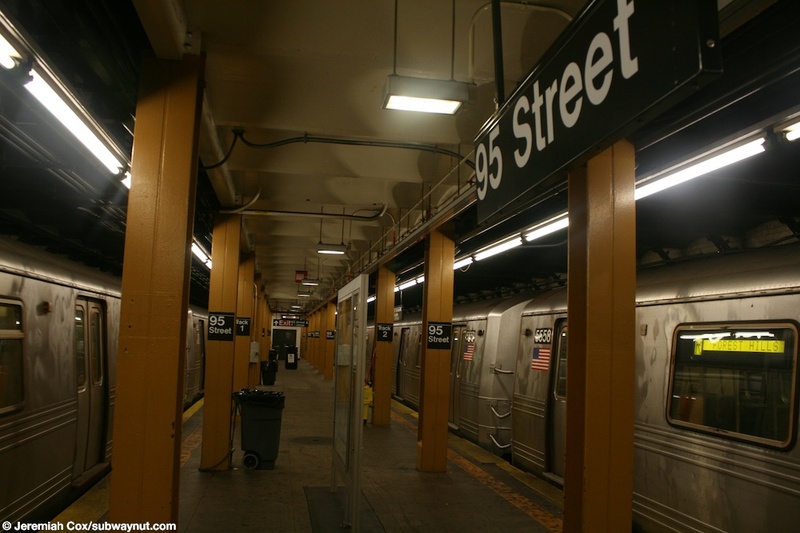 The station and tracks situated on the west side of 4 Avenue in order to leave room underneath 4th Avenue to build to express tracks if they were ever desired. These tracks probably would lead to a proposed but never materialized subway tunnel beneath the narrows. 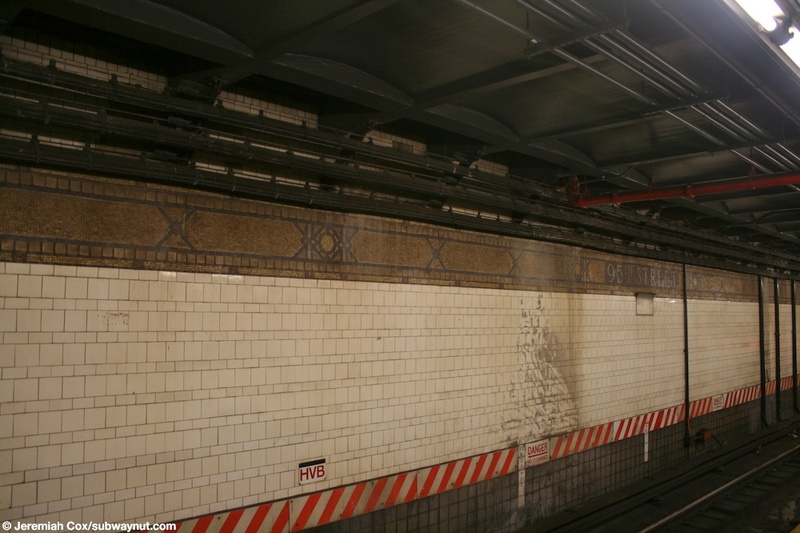 The station is also the only local stop on 4th Avenue that has its original platform tiling on the track walls. 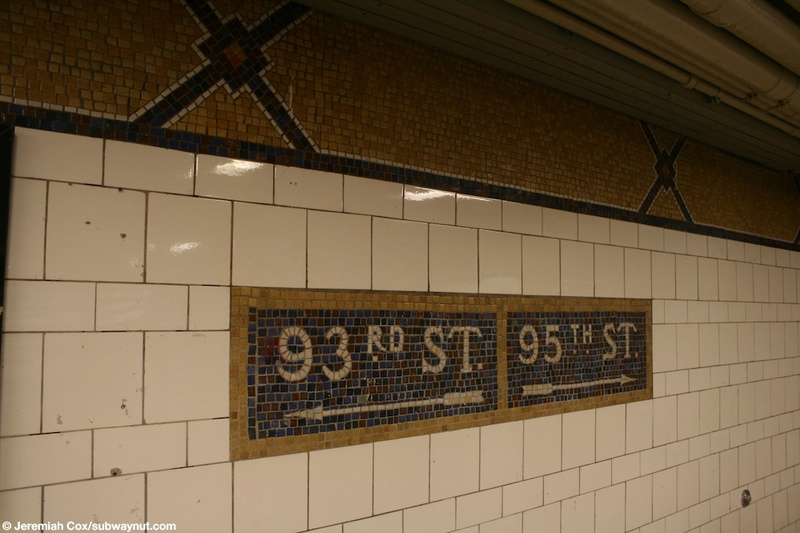 This consists of a rather wide mosaic trim line with 95th Street spelled out in it almost looking like a name tablet. 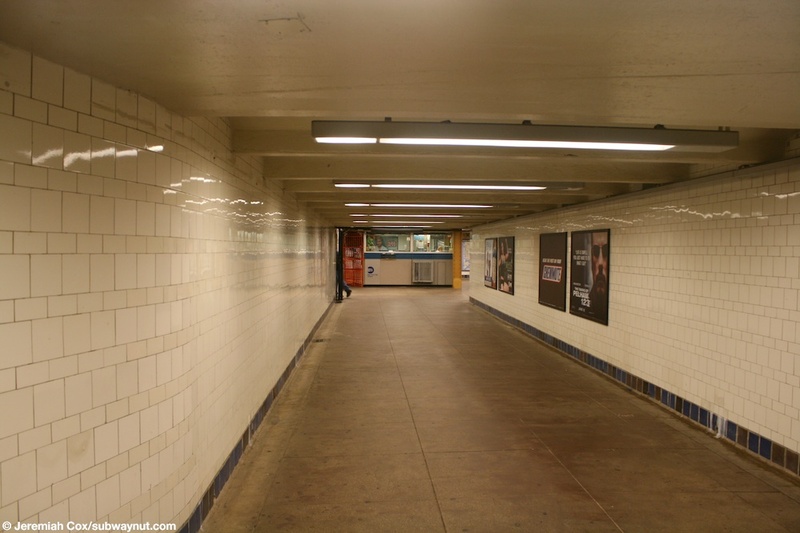 There is a small section of the platform (probably the portion of the platform that was added when it was extended) that is simply a bare black wall without tiling. 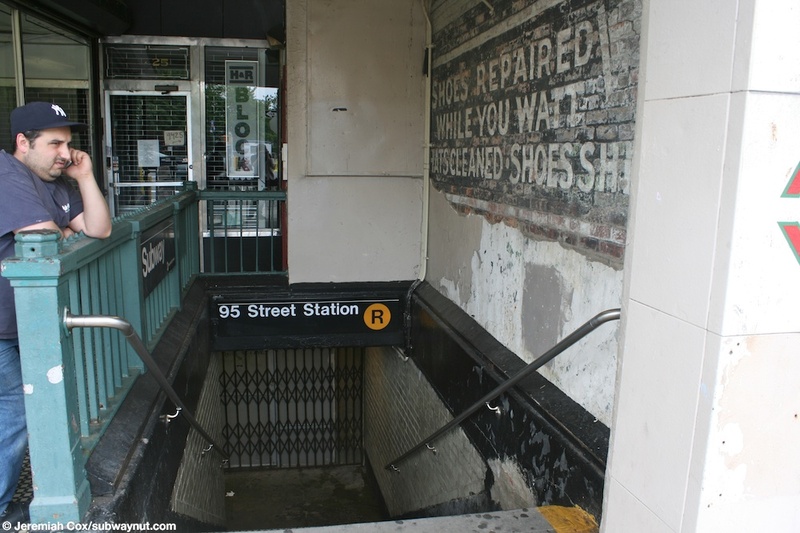 The station also has two small mezzanine areas but evidence, in the terms of the doors at either end of these and restored mosaics along each mezzanine that have arrows pointing towards both 95th St and 93rd St, that the mezzanine could have been full-length, connecting the two exits, at one time. There are also various extra rooms like at most terminal stations for uses such as crew rest quarters, little and rooms for the car-cleaner crews to wait in, and the like. 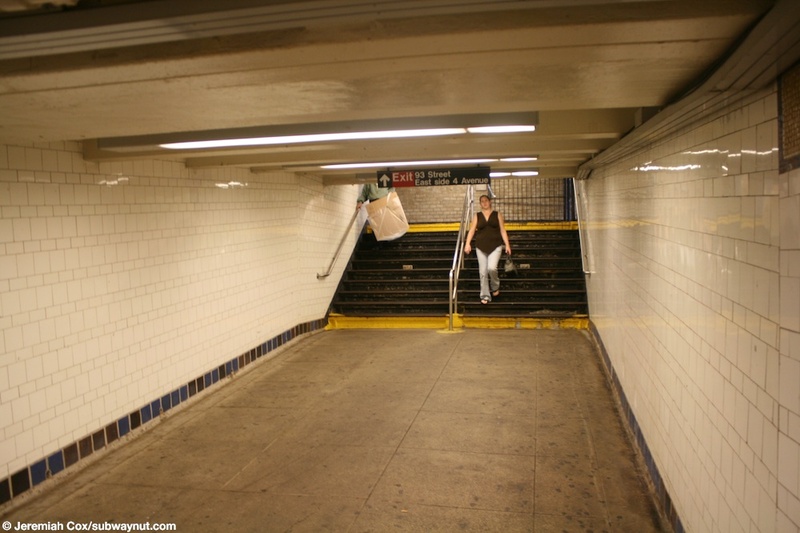 The station has two exits, one at the northern end of the platform with a single staircase up to a decently sized mezzanine to both sides of 4 Avenue and 93 Street. 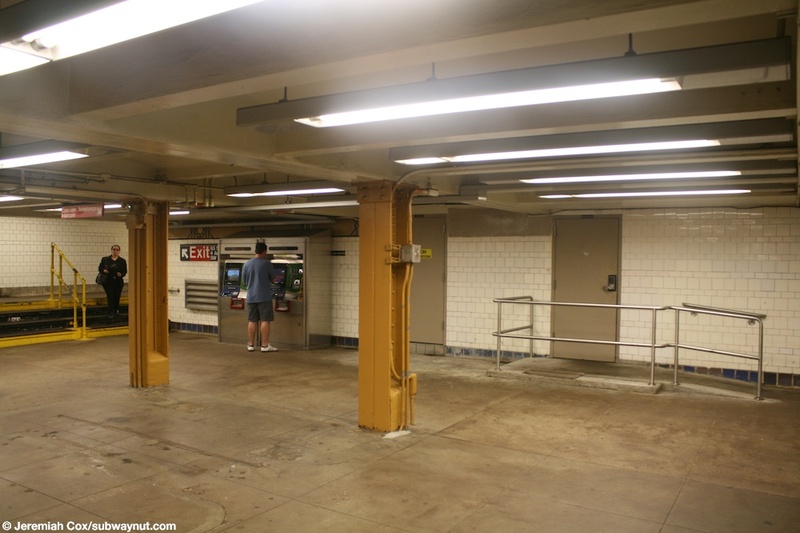 This exit is now fully unstaffed with just High Entrance/Exit and Exit Turnstiles present. The full time exit towards the southern end of the station has a bit of a larger mezzanine, with two staircases down to the platform, and public restrooms (open 5am to midnight) before the bank of turnstiles and token booth is reached. Along the passageway of decent length that leads out to the exit to the east side of 4th Avenue there is evidence of closed shops. 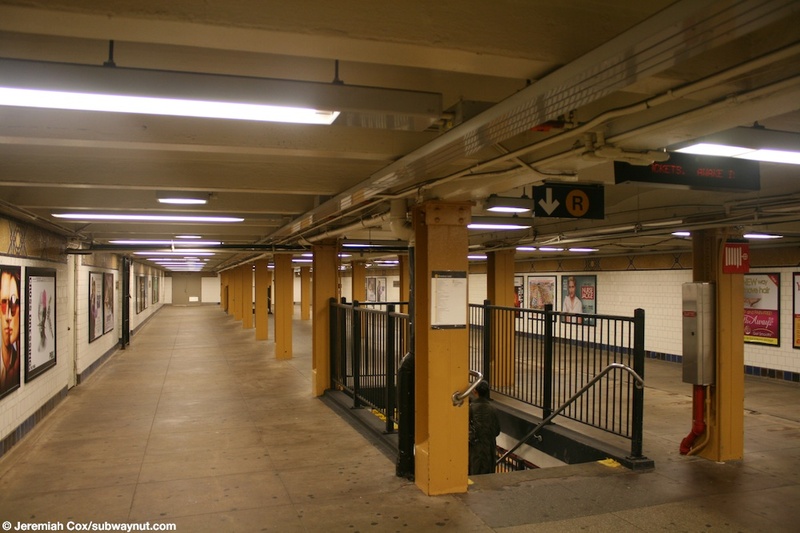 The numerous columns along the platform and mezzanines are yellow. (95r1) A single illuminated arrow tells passengers which track the next train to Manhattan & Queens will leave from at 95 Street-Bay Ridge. 9 June, 2009 (95r2) Looking down the single, narrow island platform at 95 Street-Bay Ridge. 9 June, 2009 (95r3) A line of the decorative grey trim along one of the platform walls at 95 Street-Bay Ridge. 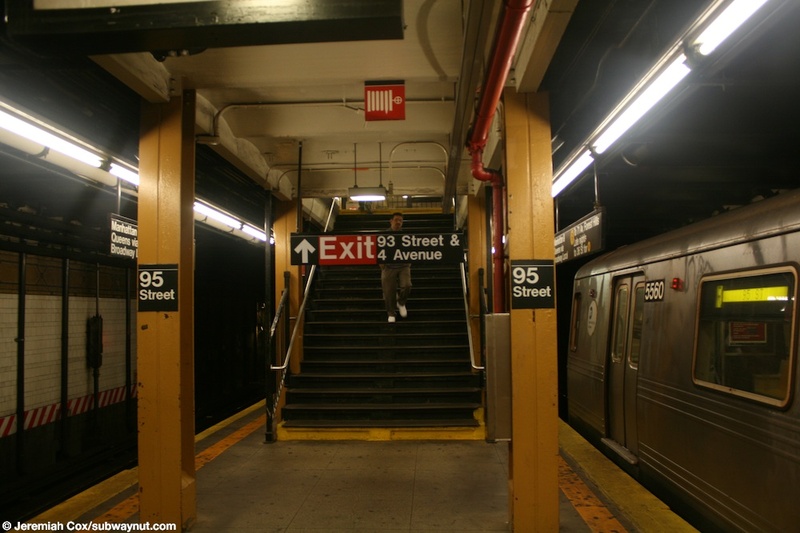 (95r5) Approaching the single staircase right at the most northern of the platform at 95 Street to the unstaffed exit to 93 Streets. 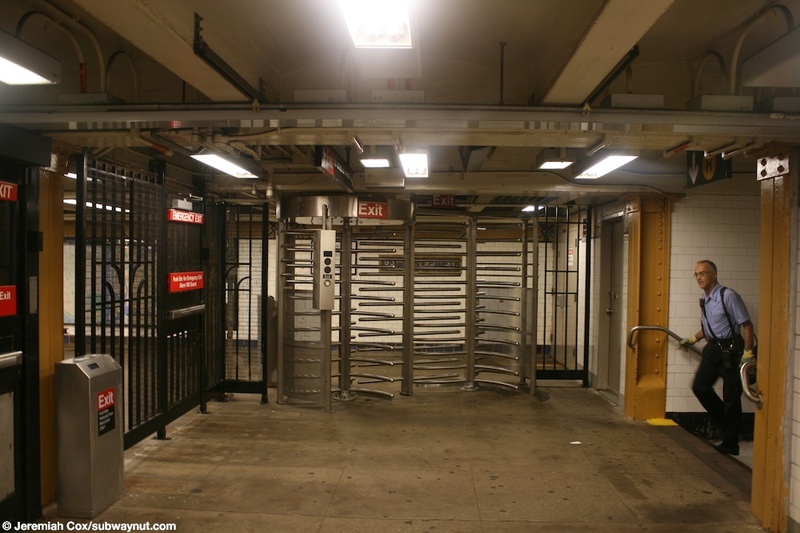 9 June, 2009 (95r6) A High Entrance/Exit and a High Exit Turnstile lead out to the exit to 93 Streets. 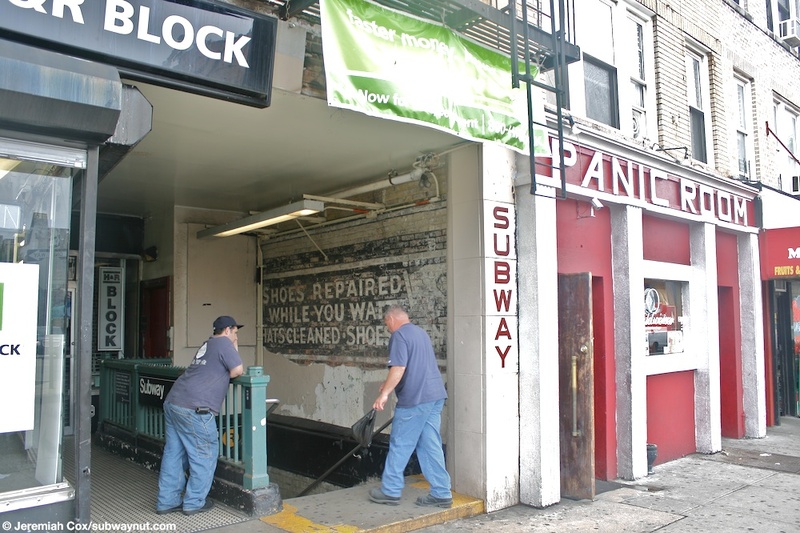 9 June, 2009 (95r7) Mosaic signs along the platform walls at 95 Street Bay ridge outside of fare control on the 93 Street exit's mezzanine have text and arrows for both exits to both 95 St and 93 St.
9 June, 2009 (95r8) The decently sized mezzanine outside of fare control for the exit to 93 Street, the doors in view lead to crew quarters. 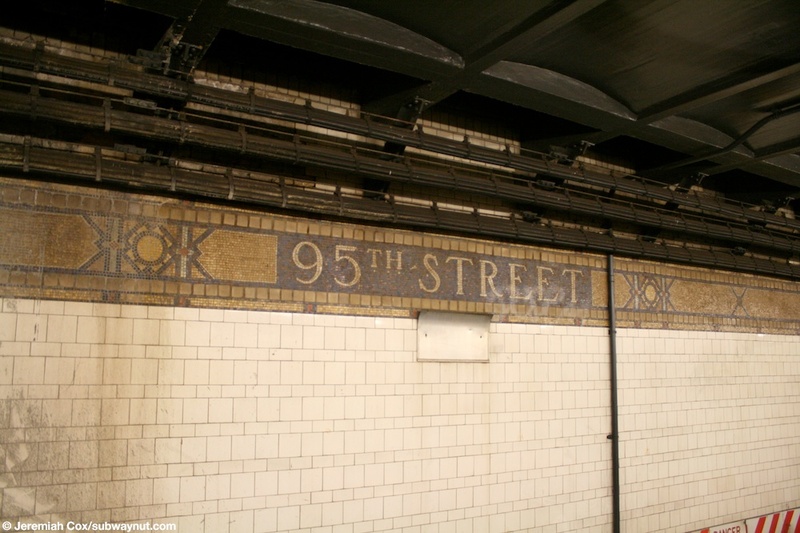 (95r9) Looking down the passageway of a decent length to the East side of 93 Street and 4 Avenue. 9 June, 2009 (95r10) Looking across 4 Avenue to a 95 Street subway entrance with the Verrazano-Narrows Bridge towering above. 9 June, 2009 (95r11) An unusual subway entrance to 95 Street with an old mosaic sign leading to a now closed shoes repaired while you wait. 9 June, 2009 (95r12) Looking down the unusual staircase down to the subway along the shopping strip at 95 Street. 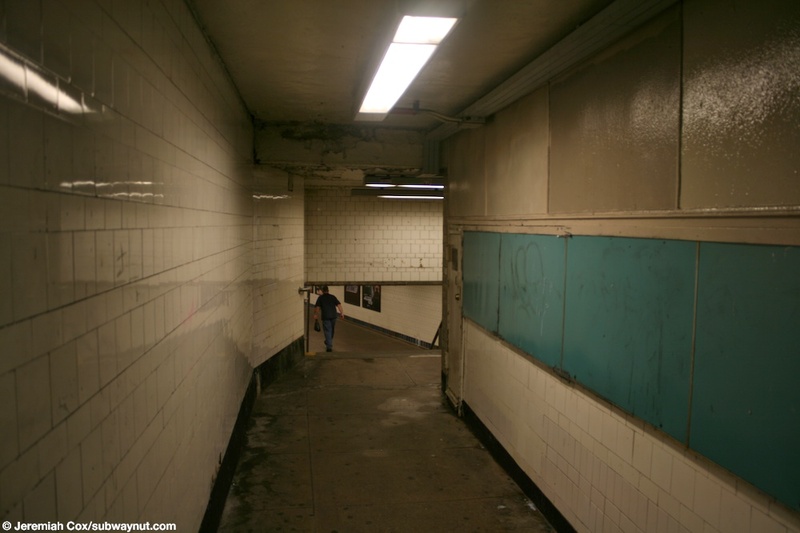 (95r13) One of the passageways to the fare control area from the 95 Street and East side 4 Avenue entrance. 9 June, 2009 (95r14) Looking down the decently wide passageway to the fare control area from the East side of 4 Avenue entrance to 95 Streets. 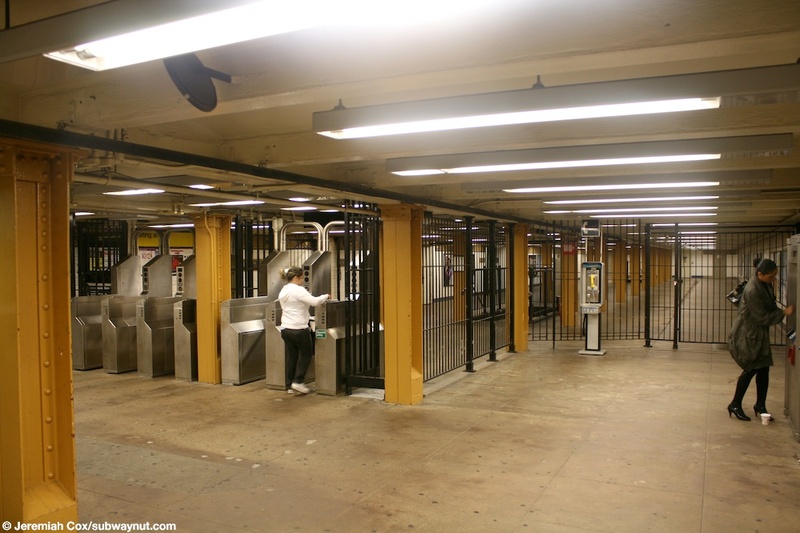 9 June, 2009 (95r15) The turnstiles and decently sized mezzanine from the 95 Street entrance. 9 June, 2009 (95r16) Looking down the decently sized mezzanine from the 95 Street entrance.